DwarfCorp [Official Site] allows you to take on an expedition of dwarves looking to make it big in untamed lands. I gave this Early Access title a look to see how it’s shaping up. 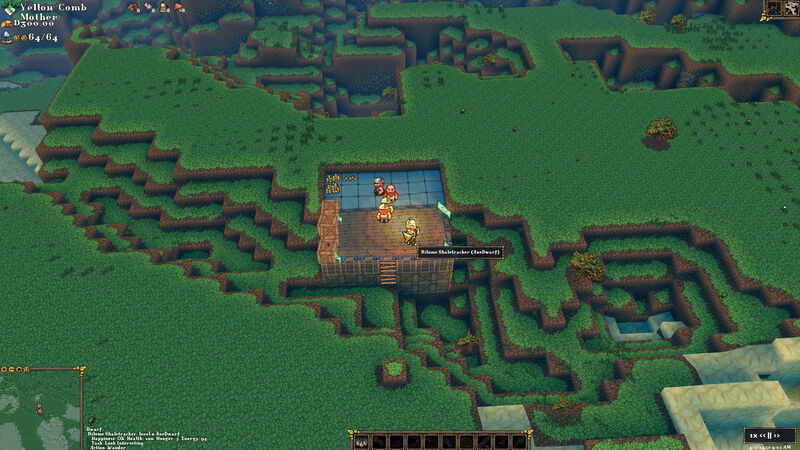 Originally crowdfunded a little over four years ago, DwarfCorp was envisioned as a more lighthearted take on the base-building and resource-exploitation types of games. You take control of a group of dwarves and a small company in hopes of gaining resources and generating industry for profit. Survival depends on trading as well as crafting the things you need. Every start of a game is similar, you either go with a random region or you specify the type of biome where you wish to settle your colony of dwarves. Each biome has its own weighted type of resources and terrain to generate and therefore its own challenges. Starting in a heavily wooded area can change the way your colony develops in the beginning as opposed to a more barren landscape rich in precious metals. Anything you don’t have, you can usually trade for with the various caravans that pass through periodically. As your colony must be built from scratch, there’s a far amount of flexibility as to how it’ll develop. There’s all sorts of things you can do, from mushroom farming and raising livestock to developing magical artifacts and doodads. Expansion is limited by scarcity of resources as well as the salary, amount of manpower and creature comforts your dwarves demand. Managing personnel is an important part of the game and handing out promotions to your dwarves can keep them happy and productive. On the other hand, having a master craftsman do menial tasks will quickly upset him and result in substandard work. Sadly, in its current state, DwarfCorp was something of a chore to play. This is the kind of game that you have to play to figure out how it works as there's no sort of introductory scenario. There’s popups the first time you click on a lot of things, outlining basic controls and concepts, but that’s the extent the game will indulge you with any explanation. Considering that this is a sandbox experience, a little guidance on what I should first build or a few milestones I should reach would have been more than welcome. Banging your head around, trying to figure out the various systems by trial and error is not good game design. This makes the difficulty curve needlessly higher than it should be as most of the common pitfalls like running out of money or knowing how many resources to invest in security or food really should be easier to figure out. This isn’t helped by the atrocious UI. Commanding your dwarves is a tedious affair, with even the simple act of selecting them being more of a hassle than it needed be. Maybe I couldn’t figure it out after a few hours (due to the lack of relevant tutorials) but pretty much every time you want someone to do something you have to drag a selection box over them (or select them all with a shortcut) and then select the activity through a bunch of small icons at the bottom and select where you want them to do it on the map. When you consider that the map has a z-axis with different layers of depth and not all dwarves are always in the same place, it’s a chore to hunt down the relevant dwarf to do any simple task. Command groups or little icons you could click to select/cycle through a dwarf would go a long way in adding to basic usability. The icons and text themselves are also small and hard to see in a lot of cases. No matter the resolution or font scaling option I selected, it didn’t really seem to do much. Partly, the text is also hard to read because of the font they chose. I’m not one to normally struggle with these sorts of things but I think that when it’s hard to make out a description or something at a glance, it brings down the game experience significantly. Things like trade and the ledger are also made needlessly difficult to parse at a quick look than needed. The biggest problem, however, is also the most fundamental. The camera controls and visibility in the game is just utter rubbish. Most of the time I spent playing I spent with a less-than-optimal camera angle. Instead of making a smooth experience like any 3d strategy game with, for example, holding the secondary mouse button to rotate, the game requires you to hold shift to rotate and panning and zooming are made inefficient. This problem is exacerbated by a bug that makes camera rotation extremely fast and unruly on Linux. It hasn't yet been fixed but at least the developer is aware of it and looking into it. Perhaps once that's sorted out I could get somewhat used to the camera control scheme but, for now, it's an exercise in pure frustration. Combined with the fact that you’re often switching between z-layers (default Q to slice to the layer your mouse is at and E to unslice completely for some reason), it’s just an absolute mess. You can click on a button on the UI to go layer by layer but it’s not as fast and responsive as it needs to be since you’re often handing out all sorts of orders to your dwarves in different places. There’s no keyboard shortcut for that either, for some confounding reason. Oh and did I mention that the game has no overlay to tell you where resources are? Imagine the fun of having to rotate the wonky camera and slice layer by layer just to see if there’s any coal anywhere. Turning to the graphical side of things, I found that the game’s art to be suitably charming. 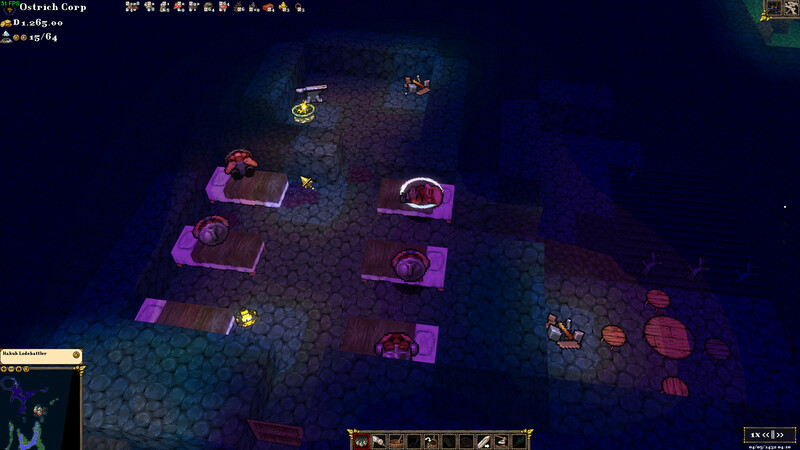 The various creatures and blocks are distinctive at a glance and look fine moving around in the game world. Performance is a bit hit or miss, however, with my FPS dropping without that much of a discernible reason. I suppose some of that could have been due to rendering far-off objects but it’s hard to test consistently due to aforementioned issues with controlling the camera. Still, the game is playable even with the occasional slowdown as it’s the sort of thing where you can pause to give commands at any time. If you’ve read thus far and are a dinosaur like me, you might be wandering how DwarfCorps compares to the infamously byzantine game, Dwarf Fortress. By and large they’re similar in concept but I’d have to say that DwarfCorps is a far more casual affair. Whereas Dwarf Fortress has things like fluid dynamics and a “world history” it generates before each game, DwarfCorp’s simulation is more concerned with the business side of things and I think more simple and responsive gameplay. I suppose that, in theory, when the game is properly out and polished, DwarfCorps won’t need that much dedication and time to come to grips with its basic gameplay. Still, there’s no question in my mind that Dwarf Fortress is currently a more nuanced game with more to do and more fun to be had in spite of the often unintuitive UI. An interesting thing about DwarfCorps is that, despite being sold commercially, the game’s source code is freely available. From my understanding the MIT license applies only to the source and assets like textures and sound are all proprietary. It’s an interesting way to go about developing a commercial game and hopefully we may get more in the way of improvements if there are forks or people who contribute to fixing bugs in the source code. As mentioned earlier, the game is still in Early Access and is currently projected to be released at the end of 2018. So there’s plenty of time for player feedback to hopefully be implemented and improvements to be made to the game. In its current state, however, it’s not worth picking up even out of curiosity. I tried to spend a reasonable amount of time with the game but found that my save games were broken between the various updates the developers pushed out. This may have been fixed with the latest update (on Oct. 10th) but as they haven’t put out any other updates since I can’t say if it’s worked. So, even if you disregard my criticisms about camera and UI, be wary. Getting to the more advanced content of the game may be impossible unless you’re willing to do it in a single sitting. Personally, I’m only going to even attempt to give this another look after a lot more work is put into the game. Fighting against the game’s controls and interface is too much of a deal breaker, whatever else the game may have going on for it. 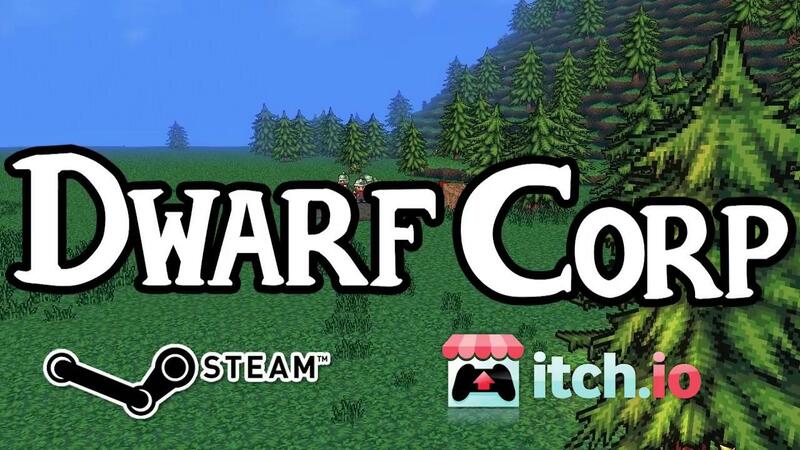 You can grab DwarfCorps on Steam and Itch. Thanks for the rich review, much appreciated. I didn't know about the game code being available. But as a fellow dinosaur I guess I cannot give this game a fair go without comparing it to DF in every aspect. Wanted to love Gnomoria for example and was not able to put a lot of time into that. Despite all the shortcomings you describe I followed the game on Steam, in hope that it some day will become the "Dwarf Fortress Light" I really would like to see. Tried it and I really like what it might become, so I hope I won't be disappointed. I like the look and feel of it but way to buggy to be interesting to play. The camera really kills it .. Completely Fair Games, Ltd.;1488861734120832228 The crazy rotation speed should have been fixed on Linux by an SDL patch we applied in early October. If it isn't fixed, that's definitely a bug and we will reopen the issue. Is this supposed to link to something? All I get is a certificate error into 404. I agree that the game requires more polish for prime-time. But some of the remarks in the article struck me as odd. Though the camera CAN be controlled by holding the shift-key, but it can be controlled by middle-mouse (holding for panning, scrolling for zoom). Shift+Left/right-mouse is probably more of a fallback. Right-mouse is currently reserved for "send dwarf here" and "cancel order", though I'd probably prefer if they switched that. When I last played it, I always used the "1" hotkey of the top-level menu to select ALL dwarves and never had to fiddle with the selection rectangle. It seems like that menu entry is broken right now though. I can confirm, that underground viewing is currently a bit of a sore point; This is essentially caused by the need to keep a whole untouched layers as floor, as opposed to DF's concept that just because there is a tunnel on two adjacent layers, there can still be a floor between them, which makes z-navigation easier and cuts out intermediate "floor" levels from navigation. Dwarf Fortress Block-only games like Dwarf-Corp ###### ####### ######### ### ############## ### #_______ #### Level1 # #### Level1 #______ ##### Level2 ############ ##### (unused*) # ###### Level3 # ###### Level2 ############### ########## ####### (unused*) ############### # ######## Level3 ############### #################### * unused levels become dead weight for camera-navigation and planning and look mis-proportioned in 3D. When reporting bugs on github  though, they are quite quick to respond, fix them, and push a new version to Steam. I can't comment on how well they handle feedback on Steam-forums though. Klaus: The thing your mention is actually a stupid concept in DF. While this can't be done in DF (or you have this weird concept of "floors". This enables you to do 3D sculpting in much more efficient manner. My bad: https was automatically applied in the editor when copying the link, fixed now. Klaus I agree that the game requires more polish for prime-time. But some of the remarks in the article struck me as odd. Middle click still has the disastrous camera issue/bug and still feels unnatural given all the rotating you're probably going to be doing. Maybe it's something I could get used to once fixed, but I did mention that in the article. As for the second point, again mentioned in the article, I know about selecting all dwarves. Still would like command groups or a quick way to select particular dwarves only. It's inefficient to select them all and sometimes you'd want to send only some of them to certain tasks in certain areas of the map. Why should I have all my dwarves tilling the earth when I need some of them to be mining or gathering or whatever else? I'd open a Kickstarter, but I can do pretty much no job in game development. After struggling for a while with version differences, I finally got this to compile and run!!! Windows only for now, but will try to get the Linux export working.